Borchuck Plaza was filled with anti-abortion and pro-choice protestors on April 5. 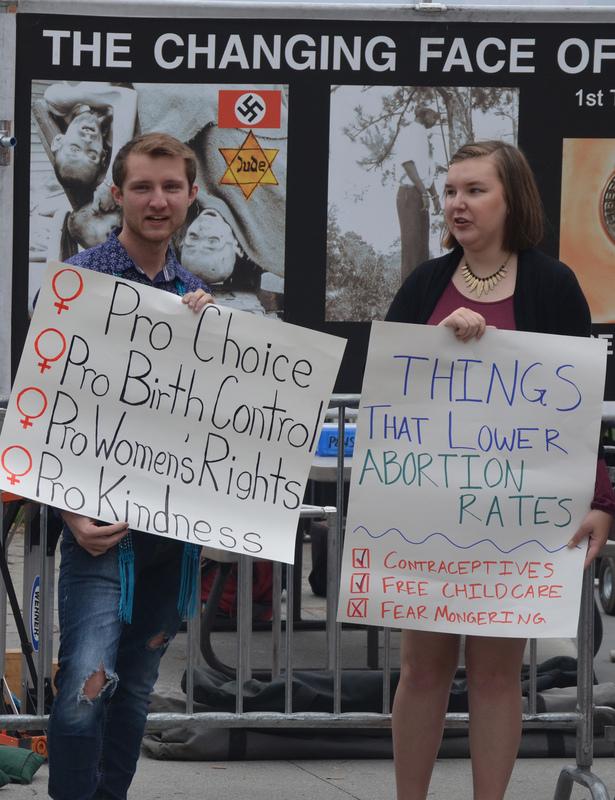 The pro-life group had a large display depicting explicit, graphic images of unborn children in various stages of dismemberment, in addition to historical images of an African-American person being lynched and the dead bodies of Jewish people during the Holocaust. The installation was part of the Genocide Awareness Project, an event put on by the Center for Bio-Ethical Reform, a non-profit, educational organization whose mission is to “show people that the pre-born are human beings and that abortion decapitates and dismembers them,” according to Project Director Maggie Edgar. Edgar got involved in the organization because she said she loved their practice approach to doing things, and helped give out information about the national hotline local women can use for help with their crisis pregnancy, as well as a post-abortion counselor who has had an abortion herself. “Social reformers throughout history have always used graphic images, even though they’re very disturbing. They’ve always used graphic images of the injustice that they’re trying to end, because for a lot of instances the injustices is sort of hidden from public view, like if you look at Martin Luther King,” Edgar said, comparing their efforts to reveal the true nature of abortion to King’s strides to expose racism. However, many ETSU students don’t feel the large displays are necessary to get the organization’s point across, and even began a counter-protest with signs. “I am an individual who has a full respect for free speech. I have a respect for individuals voicing their opinions, even if I don’t agree with those opinions. There’s a difference between educating people and sharing your voice and displaying and pushing images and false information that is offensive and is inaccurate,” said Nathan Farnor, Student Government Association Vice President and participant in the counter-protest. Farnor elaborated that many students he knew were actively avoiding the plaza unless absolutely necessary to avoid being confronted with the images on the installation. Next post No vaccines, no school?